In agriculture, the term "monoculture" describes the practice of growing a single crop or species over a large area, for years at a time. Monocultures are typical in today's industrial farming model. The reason behind monoculture farming is simple: economies of scale. Large harvests. Minimal labor. Cheap food. But there's a downside. Diseases spread quicker. Pathogens multiply more readily. Pests become more concentrated. Soils become depleted. The land loses its resilience. Food quality is reduced. The list goes on. In response, industrial farms simply apply more pharmaceuticals. More agro-chemicals. More synthetic fertilizers. And now, transgenic seeds. The soil, once teeming with billions of microbes, becomes sterile. The pollinator species disappear. The nutrient density of the food plummets. Instead of exploding with life, the modern industrial farm becomes an engine of death. But thankfully, things are beginning to change. Local, organic mixed farms are gaining momentum. Consumers are thinking before they eat. Communities are benefiting. Mixed farming is the opposite of monoculture. Cattle, crops, pigs, poultry --- all on one farm. Multiple uses. Diversity of species. Resilience. This isn't new, it's simply a return to traditional farming practices. Farms bursting with life. Nature is like that. We typically don't see monocultures in the wild. Rather we see an extravagant abundance of species. And so another important element of a living farm is wildlife. Thousands of species, from microscopic insects to songbirds to lynxes to bats to voles. They all play a role in a healthy farm. 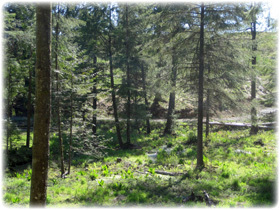 A boggy forested area on our farm. 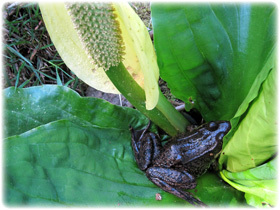 Frogs and skunk cabbage. Bear delicacies. A bear cub scampers up a tree. This is one of our boggy forests, filled with skunk cabbage and thousands of frogs. 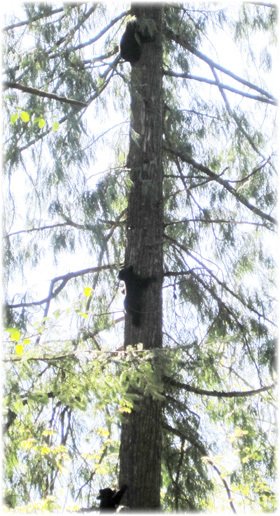 As I took these pictures, I heard a mother bear crashing through the bush, her three cubs scampering up a tree just 50 feet away. 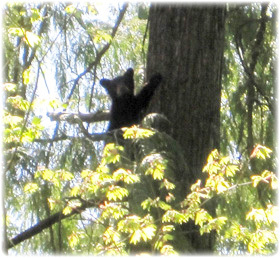 I had to hurry as I took the pictures --- I was way too close to the cubs and their mother. By keeping portions of our farm wild, we encourage beneficial bugs, we maintain a diversity of pollinator species, we build a healthy soil ecology, and we cultivate a beautiful landscape. This, and so much more. Thank you for supporting our local, organic family farm.